Gluten Free Baked Apple Mac and Cheese | Winners Drink Milk! In a stockpot, bring 1 gallon water and olive oil to a boil; add pasta. Cook 6 to 7 minutes, until not quite al dente. Drain pasta; turn into a large bowl and toss with additional olive oil. In a medium bowl, combine apple slices, lemon juice, sugar, cinnamon, nutmeg and a pinch salt; toss gently. In a medium saucepan, over low heat, melt 5 tablespoons butter. Stir in the baking mix until smooth. Gradually stir in half-and-half and milk. Cook, stirring constantly, until sauce boils and thickens. Remove from heat. Add 3 cups Cheddar, colby and Gouda cheeses, stirring until cheeses melt and sauce is smooth. Add apples to pasta; toss gently. Pour into a buttered 13×9-inch baking pan. Top with ¾ cup Cheddar cheese and dot with 2 tablespoons butter, cut into small pieces. Meanwhile, in small skillet, sauté bread cubes in remaining butter until golden brown and crisp; season with salt and pepper. Cool; crush into crumbs. Remove mac and cheese from oven; let stand 5 minutes. 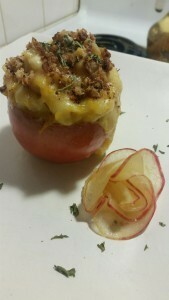 If desired, fill baked apples with mac and cheese. Top with remaining Cheddar cheese and return to oven until cheese is melted. Garnish with bread crumbs and parsley. Cut off top quarter of apples and remove cores with melon baller or sturdy metal spoon. Coat inside of apples with non-stick cooking spray and place in shallow baking pan. Bake along with mac and cheese 10 to 15 minutes or until slightly soft.